It seems older people are happy to flout far more cash than their younger counterparts when enjoying a holiday, according to a new survey. Hotels.com research among 2,000 Britons found that a fifth of those aged over 65 spend around £500 a day when away - and this doesn't even include pre-booked flights or accommodation. It was also found that older travellers tend to favour two-week breaks, meaning they spend around £7,000 per foreign holiday on things like excursions, food, souvenirs or clothing. The sum also includes a number of holiday essentials such as travel insurance for over-65s. 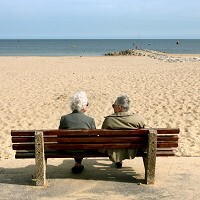 By contrast, only around one in 10 of those aged under 65 admit to spending £500 or more a day during a holiday abroad. And only one in 25 people in their thirties and forties said they would take trips of more than 18 days at a time - compared with one in 10 over-65s. The study also found that most older holidaymakers (51%) prefer to spend their travel money on boat trips and excursions to exotic destinations. Nearly half (47%) said they like to spend their money on visiting restaurants and bars, while just over a third (36%) said food shopping is a priority on their trips. One in five (20%) said they like to buy souvenirs when abroad, and around one in eight (13%) like to spend their cash on designer clothing. Lizann Peppard, PR consultant at Hotels.com, said it was "great" to see that older people enjoy such a wide variety of activities when they're on holiday. She added that many senior travellers show a "more adventurous streak" than some of their younger counterparts. Ms Peppard said the research also shows that holiday experiences are clearly being valued later in life.